Although sea otters belong to the same family as weasels and river otters, they live in a vastly different habitat than these more terrestrial-oriented cousins. Sea otters are so highly adapted to their environment that they have trouble walking on land. Because they are so dependent upon their environment, the future of marine otters lies in protecting the waters they live in. Sea otters live in the shallow marine waters of the Pacific Ocean, close to shore. Historically, sea otters ranged off the Pacific coast of Japan, the Aleutian Islands, Siberia, Alaska, Canada and the continental United States. About 2,800 sea otters remain off the coast of California, and between 64,000 to 78,000 off the coasts of Washington state, Canada and Alaska. The coast of Russia is home to about 15,000 sea otters. Fewer than a dozen sea otters remained along the coast of Japan, the group Defenders of Wildlife reported in 2012. Sea otters are predators who fulfill a vital role in their ecosystem. They consume about 25 percent of their weight per day, mainly in clams, mussels, sea urchins, crabs, octopus, squid and fish. 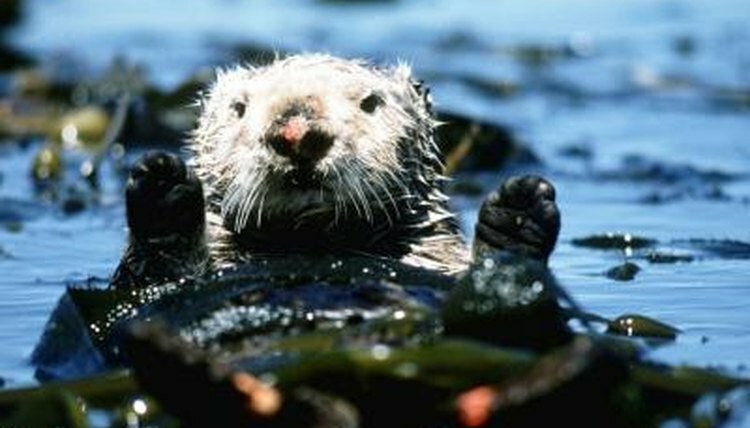 Sea otters can influence the carbon cycle by helping preserve kelp forests that sequester carbon dioxide, according to research in the journal Frontiers in Ecology and the Environment in September 2012. They eat sea urchins, which decimate those underwater kelp forests if not kept in check. Sea otters have evolved to be extremely well suited for their environment. They have large flippers and wide bodies that are well adapted for swimming and floating. Sea otters use rocks to break open the shells of mussels and clams. When sea otters rest, they often cuddle up in a kelp forest and drape the kelp around themselves to keep from drifting away with the tides while asleep. Because under the Endangered Species Act sea otters are considered threatened, it is illegal to hunt or trap them. In earlier centuries they were often killed for their fur, and by the early 20th century only 1,000 to 2,000 marine otters remained. Although the population of sea otters has been steadily increasing since then, the species is still threatened by habitat destruction, marine pollution, and oil spills.